Liberty Science Center To Offer Giant Sukkah To Public For the first time ever, the world-renowned Liberty Science Center of New Jersey will offer a Giant Sukkah for the general public on this upcoming Sukkot Holiday, October 3-7. The Science Center, famous for its hands-on exhibitions attracting thousands of children and adults daily, will feature a Giant Sukkah and refreshments and a complimentary Lulav and Etrog Stand. 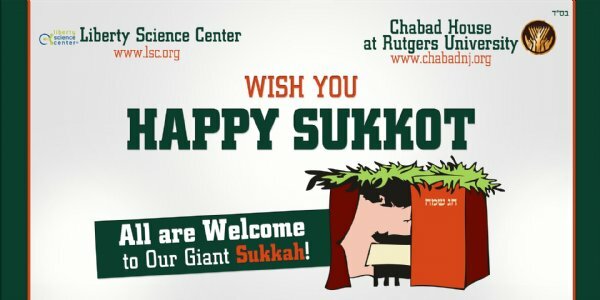 The Liberty Science Center has partnered with Chabad House at Rutgers University and expects more than ten thousand visitors to its Giant Sukkah over the Sukkot Holiday. Rabbi Yosef Carlebach, director of Chabad House stated, "We are honored and thrilled that the administration of this fine institution has chosen to serve the Jewish population of New York-New Jersey by the addition of a Sukkah to their exhibits. We are confident that this added feature will be a wonderful Holiday attraction for thousands of families and will also add a new dimension to any visitor to the Liberty Science Center." The Sukkah will be manned by volunteer Rabbis from the Rutgers Chabad House, and families are encouraged to eat their lunch and refreshments in the Sukkah. In addition, the Science Center will offer a "Minchah Room" for use during the afternoon hours. For further info please contact the Liberty Science Center www.lsc.org or Chabad House at 732-296-1800.